*Hair Origin: Russian. *Grade 10A: Multiple donor Russian human hair. *Density: 400% (400g bundles + 10" Lace closure). 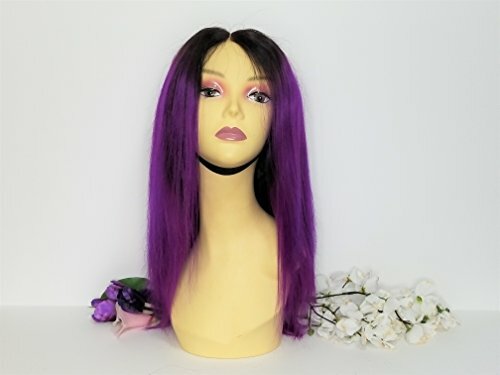 *Lenght: 12" *Style: Silky straight ombre lace front wig (Handsewn) *Color: 1b/purple (professionally colored). **Guarantee: tangle free, chemical free, and very minimal shedding. *This wig can be worn in its natural silky straight state, or curled with a wand or flexi rods. *Can be worn as mid or side part. *Cap Style: Black Mesh Cap with adjustable strap & combs. **This unit is available to Ship in 1 business day. If you have any questions about this product by Qualityhairbylawlar, contact us by completing and submitting the form below. If you are looking for a specif part number, please include it with your message.